Art-C: The Sitar....a soulful musical instrument that needs no introduction!!!! The Sitar....a soulful musical instrument that needs no introduction!!!! An instrument that was predominantly Indian, but gained huge popularity in the West due to the Beatles & Pandit Ravi Shankar, is the Sitar....George Harrison infact used it for the first time in pop music in the song, "Norwegian Wood (This Bird has flown) " on the LP Rubber Soul in 1965. Used mostly in Indian classical music, its versatility has been known to encompass any & every musical genre. The origins of the sitar are very vague with some saying that it was developed in the 13th Century by Amir Khusro from the Tritantri Veena, a member of the Veena family. Others say that it might even have been developed during the time of the Moghuls & based on the persian lutes. It is basically a stringed instrument which derives its sound from sympathetic strings, a long hollow neck & a resonating chamber resembling a gourd. The sitar's curved frets are movable, allowing fine tuning & raised so that the strings (tarb) can run underneath them. 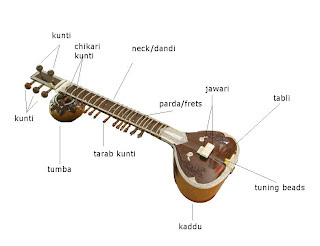 A sitar can have 17 to 22 strings, among which 6/7 played strings run over the frets. 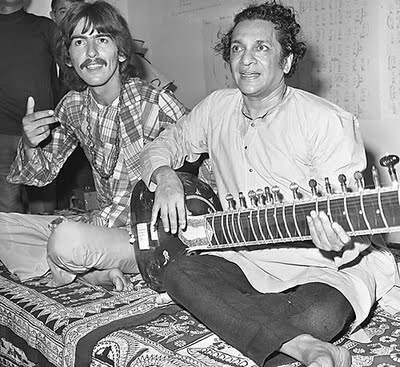 The Gandhaar-pancham sitar (used by Ustad vilayat Khan) has 6 playable strings & the Kharaj-pancham sitar (used by Pandit R Shankar) has 7 playable strings. 3 of these playable strings (called the chikaari) just provide the drone & the rest are used to play the melody. The gourd part of the instrument has 2 bridges & the timbre of the music results from the way the strings interact with the wide sloping bridge creating a distinct tone. The maintenance of this specific tone by shaping the bridge is called jawari. A metallic plectrum, called mizraab is used to produce music & the instrument is played by balancing it between the player's left foot & right knee & never carried around, unlike other musical instruments. Materials like teakwood are used to make the neck & the tabli whereas the instrument's bridges are made from deer horn, ebony or camel bone. The sitar has been used for a variety of songs & music & became very popular in the '70's even finding its way into films & albums. This was because of the newness of the sound & its ability to merge into any style, as a lead in a song or a part of the background score. 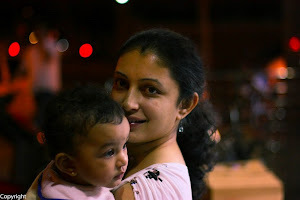 Its soulfulness gave it a versatility that was widely accepted & although the craze for the instrument has mostly died down, it continues to enrich the the legacy & traditions of classical music in India!!! !